The floods that devastated the Northern Province have now receded and the clean-up efforts are currently in full force. Over 100,000 people were affected and a large number of people were displaced in Vavuniya, Kilinochchi, Mullaitivu, Mannar and Jaffna due to the heavy rains and the resulting flooding. The Iranamadu tank filled to above capacity and with the opening of the sluice gates, many of the low-lying areas were inundated and several smaller tanks had also breached their banks due to the heavy rains. Among the affected areas, the Kilinochchi district was the worst affected and on December 22, 4,477 persons from 1,494 families were displaced due to the floods. The number of shelters set up for the displaced in the Kilinochchi district was 16. The situation worsened on December 23 with the number of displaced rising to 7,050 persons belonging to 2,264 families and the number of shelters they were housed in increasing to 17. However, by December 24, the situation improved with the floodwaters receding and the number of displaced persons reduced to 3,459 persons from 1,043 families housed in 12 shelters, while the others had gone back to their homes. With the highest number of those affected being in the Kilinochchi district, the Kilinochchi Security Force Headquarters played a big role in saving lives and also providing for and assisting the affected people in the area. The majority of the troops deployed for ground operations were from the 57 Division and the 66 Division. Nearly 442 Army personnel including officers were deployed for flood operations on the first day of the floods, while 560 more were deployed on the second day of the flooding in the district. Further on December 24, 530 troops were deployed for flood operations and on Christmas Day, 500 troops were deployed to assist those affected. On December 26, 550 troops were deployed for clearing and repairing operations, on December 27, 514, on December 28, 580, on December 29, 540 and on December 30, 450. However, he said as of now, all shelters have been closed and the displaced have returned to their homes as the water levels have receded. “These civilians requested for Army support for the cleaning operations, especially of their wells. Therefore, we are currently engaged in supporting the civilians clean their wells with the assistance of the Navy,” Maj. Gen. Ravipriya said. Those displaced were provided food, water and essentials by the Army on the first day of the floods. The GA’s office took over the provision of cooked food for those in shelters from thereon. Meanwhile, a large amount of dry rations and other essential items were donated from various parts of the country and these are being distributed to the affected people through the Army. “Until December 30, we were distributing the dry rations to the welfare centres, but now, since the civilians have returned to their homes, we have commenced the distribution of these relief items to their doorsteps,” Maj. Gen. Ravipriya said. Maj. Gen. Nugera noted that the Army had been deployed on the ground for a long period of time and they had built a good relationship with the local people. Army Commander Lt. Gen. Mahesh Senanayake has been very precise in positioning the Army in a specific manner, he said, adding that this strategy has proved effective, as correct positioning did play a vital role in assisting the people during the recent floods in the area. As of Sunday (30) evening, six Sri Lanka Sinha Regiment, three Gajaba Regiment, nine Vijayabhahu Infantry Regiment, and 14 Sri Lanka National Guard troops with the cooperation of their counterparts in the Sri Lanka Navy completed the cleaning of 102 domestic wells in those respective areas after making a preliminary review of the post-flood situation and priorities. Both the SF-KLN Commander and the 57 Division GOC are still continuing to provide cooked meals to certain areas, since the flood devastation has destroyed even their pots and other cooking utensils. Meanwhile, six Gemunu Watch troops under command to the 683 Brigade renovated and plastered the outflow opening of the Udayarkattu tank using sandbags and other equipment, in the general area of the 68 Division, close to Mullaitivu, on December 26. Further, the 591 Brigade under command to the Security Force Headquarters - Mullaitivu donated bottles of mineral water to flood-affected families in Selvapuram village with the cooperation of Edinborough (Pvt) Limited on December 27, as the residents did not have safe drinking water since their wells had all been contaminated due to the floods. 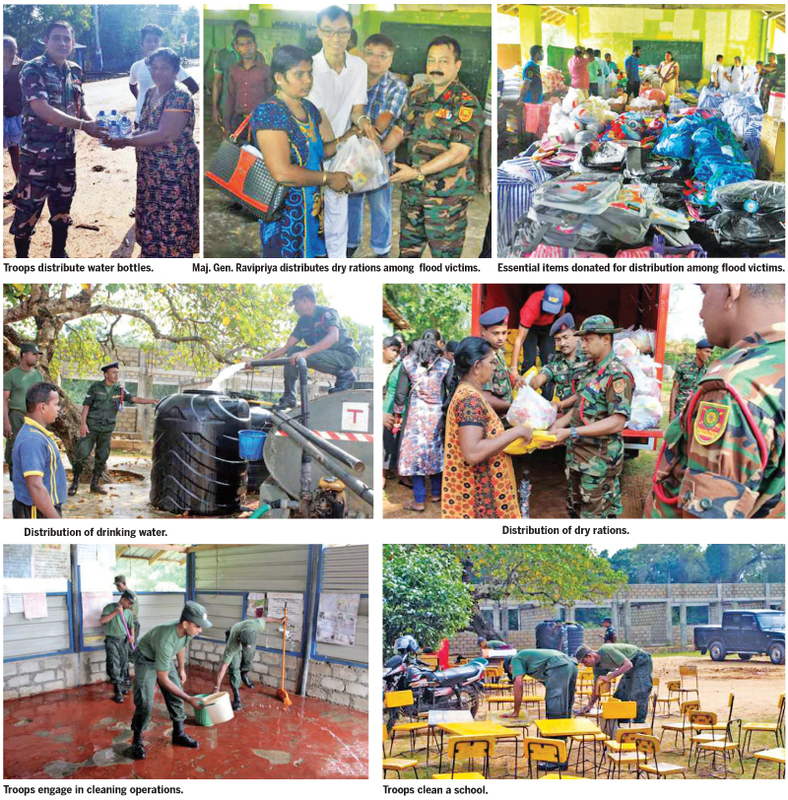 Meanwhile, 50 troops of 14 Sri Lanka Sinha Regiment and six Sri Lanka National Guards of the 641 Brigade of the 64 Division under the SFHQ-MLT cleaned the Mannakadal School and Pandarawani Community Hall which were used as temporary camps for displaced personnel due to the floods, on the directions of the 64 Division GOC and under the supervision of the 641 Brigade Commander. 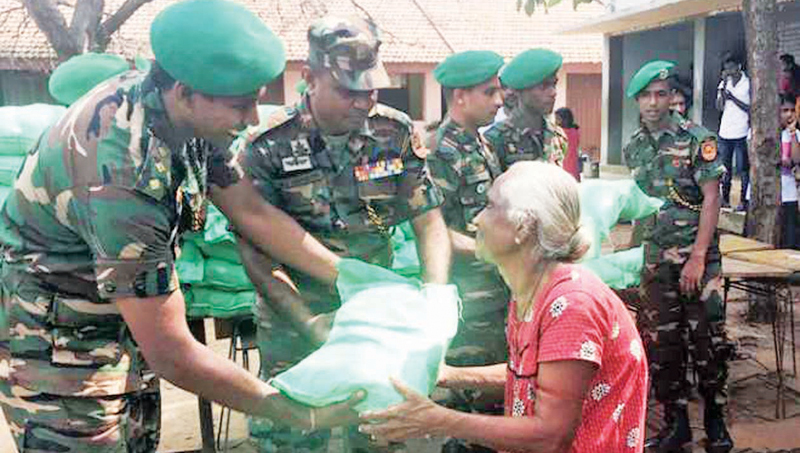 Troops of the 571 Brigade under the 57 Division of the Security Force Headquarters - Kilinochchi (SFHQ-KLN), in liaison with Manusath Derana and Ceylinco Insurance Co. Ltd, supported the distribution of relief meal parcels among 250 flood victims in Rathnapuram, Anandapuram and Barathipuram areas last Saturday (30). Also, troops of the 573 Brigade in liaison with Ceylinco Insurance Co. Ltd distributed 150 dry ration packs among civilians in Pulliyanpokkanai Grama Niladari Division last Saturday as well. Further, troops of the 64 Division, on the directions of Major General Dushyantha Rajaguru, Commander, Security Forces – Mullaitivu and under the close supervision of 64 Division General Officer Commanding Brigadier Jayanath Jayaweera, rescued many of the stranded flood victims, braving the heavy downpour with the support of the life-saving team of the nearby Special Forces (SF) and sailors of the Navy in the Nayaru detachment in close proximity. Troops evacuated over 100 men, women and children, stranded inside their own houses and carried them to safer locations with the support of boats. Some of the feeble and children had to be carried on shoulders of the soldiers as flood levels were fast swelling. As of December 23rd, 682 people of 276 families have been relocated to safer locations and troops continue to provide them with cooked meals and immediate medical aid. Similarly, troops were compelled to clear one of the major supply routes, the Nedunkerni–Mullaweli road which remained blocked due to fallen trees. Around 300 breakfast packets were also distributed among stranded people. Meanwhile, as water levels in flood-affected areas in Kilinochchi are fast receding, life in flood-affected Rathnapuram, Anandapuram Bharathipuram, Kalinagar, Ulawanur, Mailawanapuram, Kolondupuram, Kallaru, Dharmapuram, Welikandan, Marusumotei, Uriyan, Kandaweli, Nagendapuram, Pannankaddi, Ponnagar, and Indupuram village areas is returning to normal as of Sunday (30), with the assistance given by Army and Navy troops serving those areas.